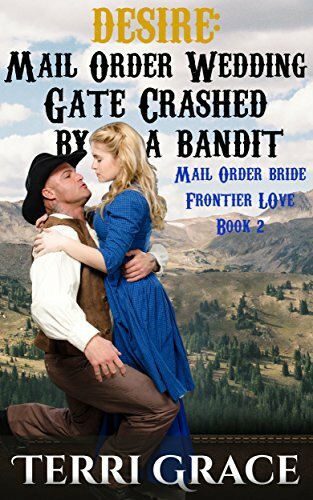 All three Christian historical Western romances in the fast-paced and deeply romantic Frontier Love Trilogy by popular author Terri Grace in one beautiful box set. PLUS an extra bonus story from ‘The Young Mail Order Brides of Montana’ Collection. It’s 1867 and sparks are flying in the small frontier town of Firestone, Montana. ‘Frontier Love’ follows the struggles of Mail Order Bride, Ginny Douglas, and pioneer cowboy, Manly Forsythe, as they overcome every challenge the wild West throws at them to finally find a love that will last forever. Virginia “Ginny” Douglas arrives off the mail coach to meet the man who will be her husband. Manly Forsythe appears with his wagon to take her first to the church and then to his mountain homestead. Ginny has her own ideas for her future though. She won’t go anywhere with him, let alone marry him, until she’s seen her new home for herself. She books a room for herself, with her own money, in the local hotel, until he can take her to see the homestead. Only then will she agree to marry him. Manly must spend the night in the livery stable. Things do not go as planned, however, and on their way to view the homestead, Ginny and Manly find themselves thrown into danger and uncertainty. They must trust and rely on each other, and in God, beyond anything they ever thought possible before they can live happily ever after as man and wife. This beautiful tale of strength, love and faith against all odds will have you on the edge of your saddle! After their harrowing experience in the wilds of the Western Frontier, Ginny Douglas and Manly Forsythe finally come to the church to join their lives together forever. In the midst of their joy and excitement, unforeseen circumstances conspire to foil their plans. A man with Ginny in his sights resurfaces and threatens everything she hoped to gain by marrying Manly. With a rival on the scene, will Manly turn his back on Ginny and return to his solitary life in the remote Montana mountains? Will Ginny be able to marry the man of her dreams after all? The trials and conflicts leading Ginny Douglas and Manly Forsythe to wedded bliss pale in comparison to the dangers and challenges ahead of them. They wake up on their wedding morning surrounded by the blessed glow of contentment and fulfilment, but they still have the journey back to their homestead to get through. Demons from Ginny’s past, the unpredictable mountain environment, and their own untried relationship all converge on the newlyweds to test them to the limit of their endurance. Can their new marriage survive a lifetime of uncertainty in a few days? Will they reach their destination alive and with their love intact? Beautiful young Mail Order Bride, Lillian Jackson, rides out to meet her future husband, accompanied by her over-protective father. Her Pa insists on checking out the man proposed to be his daughter’s husband. He is reluctant to let her go. Through a series of unexpected circumstances, the shining character of Austin Blake wins even Pa’s reluctant admiration, and the biggest and most joyful wedding in the history of Morgan Pass brings the community together to celebrate Lillian and Austin’s love. Other Books in "Frontier Love"